Sacha inchi, a little-known oilseed, also known as Inca nut, Inca peanut, or mountain peanut, among other names, has been gaining attention in recent years thanks to its astounding nutritional profile. The sacha inchi plant is thought to have been domesticated by humans in South America even before records began. 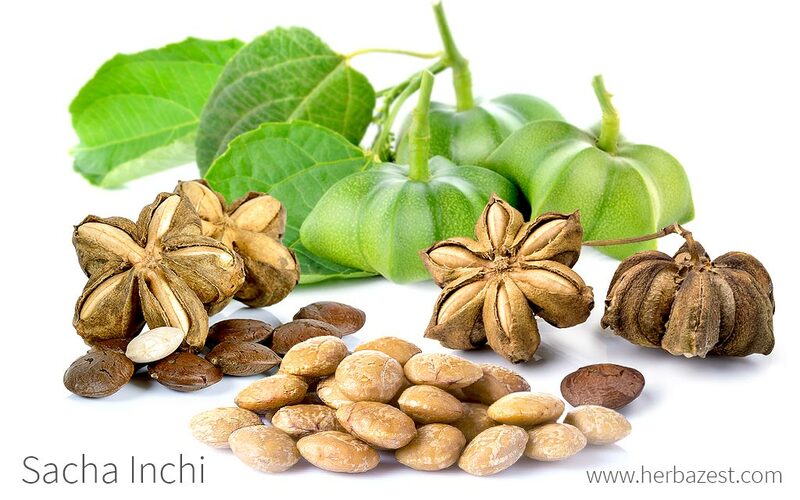 Since ancient times, sacha inchi has been highly valued for its medicinal and nutritional properties. It wasn't until recently, however, that the remarkable sacha inchi benefits have started to gain recognition worldwide, as science has begun to reveal their secrets. Learn more about this Amazonian superfood. Supporting muscle-building. Because of its impressive concentration of lean protein, sacha inchi has shown to be effective for maintaining and building muscle mass. Protecting cardiovascular health. The amount of omega-3 in sacha inchi helps balance cholesterol levels and lowers blood pressure, thus reducing the risk of heart disease and metabolic disorders. Traditionally, Amazon natives have used sacha inchi to treat rheumatic pain, but this use has not been verified and is not as common as its cardioprotective applications. Sacha inchi seeds contain large amounts of essential amino acids and alpha-linolenic acids (ALA), particularly omega-3 fatty acids. Although dietary allowances are expressed as protein, the biological requirement is really for amino acids, which are the building blocks of proteins and also intermediate in metabolic functions. There are nine amino acids—histidine, isoleucine, leucine, lysine, methionine, phenylalanine, threonine, tryptophan, and valine— that the human body can't produce, and all of them are provided by sacha inchi seeds. It has been recently discovered that sacha inchi is particularly rich in an essential amino acid called tryptophan (44 mg/g of protein), which is crucial for the synthesis of serotonin in the brain, playing an important role in mood, behavior, and cognition. It is commonly used for reducing stress and inducing sleep. On the other hand, omega-3 and omega-6 fatty acids cannot be produced by the human body, and it is important to consume them from food sources in order to avoid a deficiency. This high fatty acid content gives sacha inchi its cardioprotective properties. OMEGA-3 FATS HELP REDUCE CHRONIC DISEASE RISK BY BLOCKING INFLAMMATION. Other herbs particularly rich in omega-3 fatty acids are chia and flax, whereas peanut, quinoa, and amaranth also support muscle growth. Sacha inchi is generally well tolerated, and no toxicity to the liver or kidneys has been observed. Many people experience nausea when first consuming sacha inchi oil, but this typically goes away after one week. Most sacha inchi benefits for human health are derived from its nutrient-rich content. Scientific research has shown that sacha inchi nuts are loaded with dietary fiber and essential amino acids, and they should be considered as an important source of health-promoting phytochemicals. Sacha inchi nuts provide all nine essential amino acids —histidine, isoleucine, leucine, lysine, methionine, phenylalanine, threonine, tryptophan, and valine—, which the body transforms into protein, necessary for healthy muscles and optimal metabolic function. Sacha inchi powder provides 4.5 grams of protein per 15 g (a tablespoon), which is significantly higher than that found in chia and quinoa. This information uses, as a reference, the recommended Daily Value (DV) for adults, which is 50 grams/day. On the other hand, sacha inchi oil contains 47% DV of omega-3, only surpassed by flax seed oil, which provides 57% DV, and it is considered the best vegetable source of alpha-linolenic acids (ALA). However, the recommended daily intake of omega-3 is of 1.5 grams for healthy adults, and a tablespoon of sacha inchi oil largely exceeds that amount. Additionally, the also called Inca peanut provides small amounts of some essential minerals, namely calcium and iron, both necessary for healthy bones and red blood cells production. 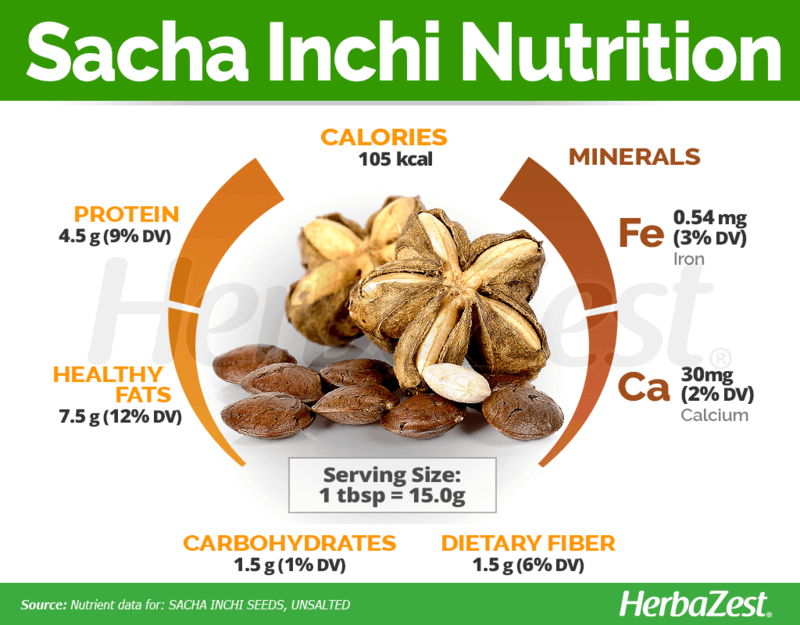 A tablespoon of sacha inchi nuts (15 grams) provides 105 calories, as well as 9%, 12%, and 6% of the daily value for protein, healthy fats, and dietary fiber, respectively. Sacha inchi can be found in supplemental forms, such as capsules, and also as food, in the form of oil, powder, and snacks. 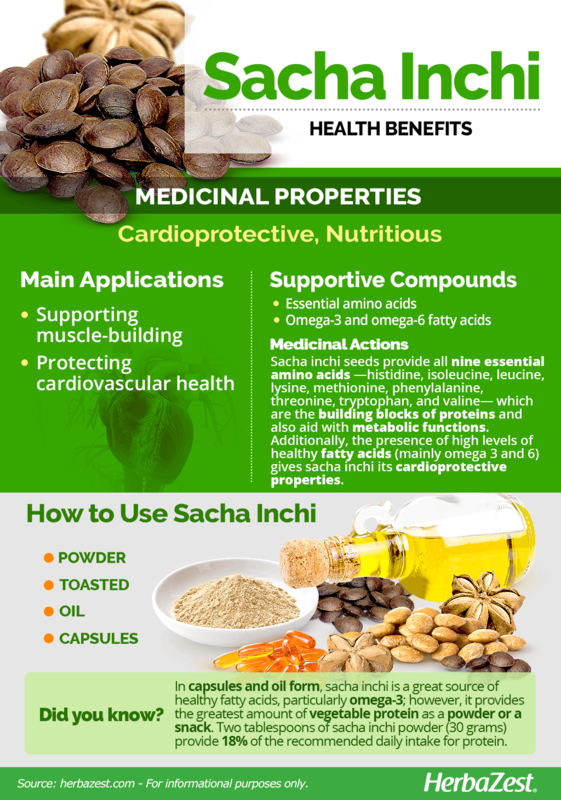 In capsules and oil form, sacha inchi is a great source of healthy fatty acids, particularly omega-3; however, it provides the greatest amount of vegetable protein as a powder or a snack. Pure powder. The dried and ground sacha inchi nuts can be added to juices, smoothies, and even baked goods for extra protein. Toasted. As a healthy snack for boosting energy throughout the day, the roasted inca nuts provide both protein and healthy omegas in small amounts. However, it is important to choose packed snacks without sodium. Oil. For a daily dose of healthy fatty acids, the pressed oil of sacha inchi nuts can be taken by the spoonful, in medicinal doses, or be used as salad dressing, though it is not appropriate for cooking since its essential nutrients become degraded when exposed to heat. Capsules. This widely preferred sacha inchi supplement carries a high concentration of omega fatty acids and can be taken in easy to swallow, fixed daily doses to improve cardiovascular health and for reducing the risk of inflammatory diseases. Outside of its native region, sacha inchi is most commonly found in powder and capsule form, although sacha inchi oil and roasted inca nuts can also be found. Both sacha inchi pure powder and pressed oil can be found in health food stores year-round, as well as via online retailers. Additionally, roasted sacha inchi nuts are available in some organic markets. Sacha inchi nuts are most commonly pressed and transformed into oil, which is commercialized as easy-to-swallow gel caps for a daily dose of omega-3. 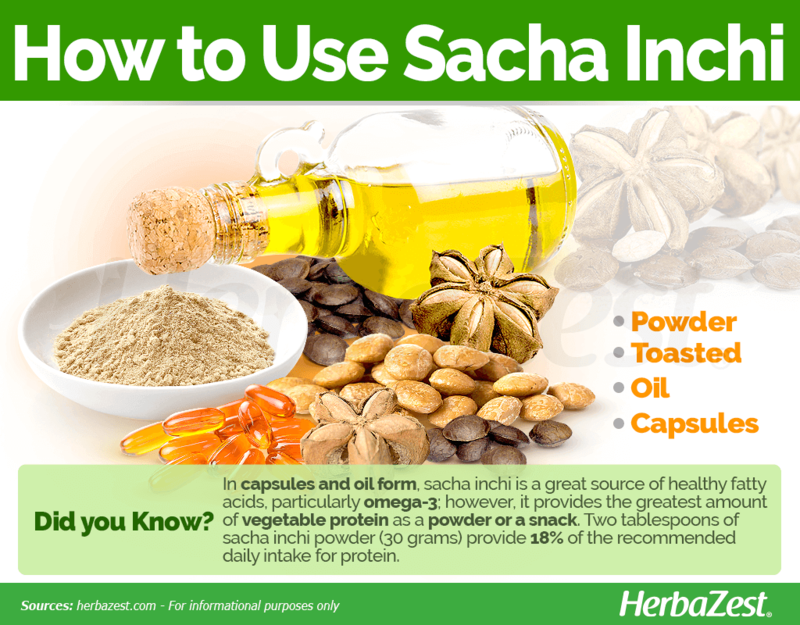 In this supplemental form, sacha inchi is available in health food stores, as well as through big online retailers. Also known as Inca nut, Inca peanut, or mountain peanut, the sacha inchi plant (Plukenetia volubilis) is an herbaceous perennial, native to the Peruvian, Colombian, Venezuelan, and Brazilian Amazon rainforest. The sacha inchi plant only grows in tropical climates at 5577 feet (1,700 m) above sea level. The sacha inchi plant has heart-shaped leaves about 4.0 - 4.7 inches (10 - 12 cm) long. It is more recognizable, however, by its star-shaped fruits, which have anywhere from four to seven points. Its seeds, commonly known as nuts, are brown and oval, measuring 0.6 - 0.8 inches (1.5 - 2 cm) in diameter. The sacha inchi plant (Plukenetia volubilis) belongs to the Plukenetia genus, which is a member of the Euphorbiaceae family, a botanical group that contains around 7,500 species spread out over 300 genera. This family of flowering plants is found mainly in the tropics, and a number of the members are economically important, including the rubber tree (Ficus elastica), the castor oil plant (Ricinos communis), and the Barbados nut (Jatropha curcas). Although no subspecies of Plukenetia volubilis have been identified, agronomists have described five varieties of the plant based namely on the region. These include the Pinto Recodo, Tambo Yaguas, Muyuy, Rio Putumayo, and Cumbaza varieties. The Plukenetia genus contains 14 other species, most notably P. fragariopsis and P. angostylidium. It is thought that the sacha inchi plant was first domesticated in the Peruvian portion of the Amazon basin. The earliest evidence of its use can be traced to 3,000 years BCE, as sacha inchi nuts appear as a common motif on pottery belonging to the Chimu and Mochica societies. These ancient civilizations are thought to have settled on the present-day Peruvian coastline, implying that they brought the plant with them from the Amazonian rainforest. It is believed that sacha inchi acquired medicinal and ceremonial importance even before the rise of the Inca Empire, since the nuts depicted in pottery have also been found in burial sites of the Chachapoyas civilization, circa 800 CE. The common name of this Amazonian fruit is made up of two Quechua terms: sacha, meaning "tree or bush", and inchi, which translates as "nut or seed", so sacha inchi literally means "tree nut." Sacha inchi's economic importance has increased in recent years, after it was found that this herb produces higher yields per hectare than other plants that are used to produce oils and proteins for human consumption. Currently, Peru is the largest producer and exporter of sacha inchi nuts; however, Colombia and Ecuador also cultivate the plant in smaller scale, mostly for oil production. 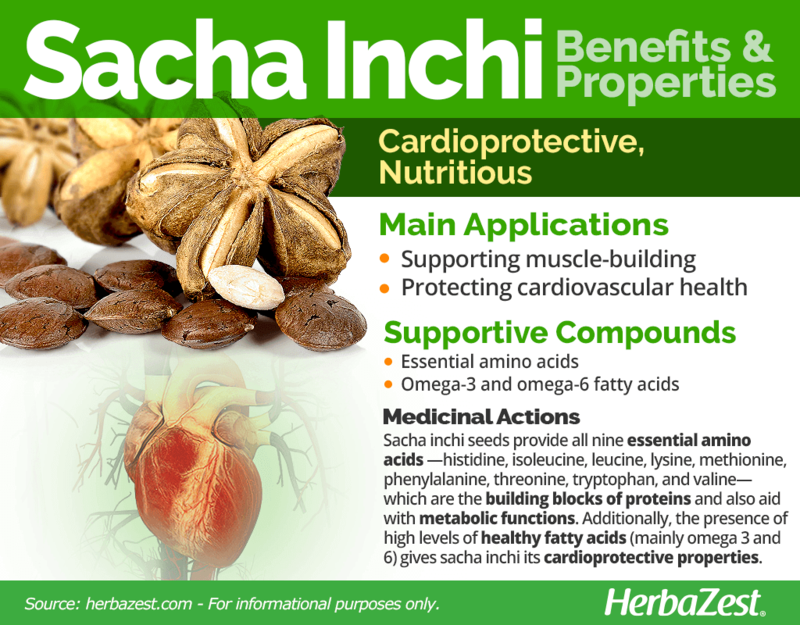 Sacha inchi is also one of the richest plant sources of omega-3 fatty acids, which makes its production valuable, as it is of great interest to the "nutraceutical" industry, vegetarians seeking an alternative protein and omega-3 source, and an increasing number of people facing high cholesterol due to an unhealthy diet. Personal care. Sacha inchi nuts have found additional uses in the cosmetic industry, where their oil is used in various products, including soaps and shampoos.